Though it has been nearly two years since I have posted to my blog, I now have something new that’s worth writing about! I have been blessed with a new grandson! This event inspired me as a dad (now a granddad) to put together a new book about kids… my kids, your kids… a book about every parent’s experience in raising kids. Everyone has a story, whether it be from your own childhood, your family or your friends. Somewhere in your memory, there is a happening that involved kids, their logic, their determination, their raw and innocent responses to situations. Many of these recollections are priceless treasures that beg to be shared with others. I have collected a few of these stories, along with some of my own experiences and recollections for this first volume of What the Kid Did! I hope that this little book will inspire others to reach back into their memories and recall some of their own childhood adventures and happenings. New hardcover copies are available now. (See below). This post is an early call for entries for the 2015 volume of What the Kid Did! If you have kids, I know you have stories, and I’d like to hear from you. Send me your story, and if we like it, it could appear in our next issue to be published in late November 2015. All published contributors will receive a complimentary copy of the new hardbound edition by mid December… just in time for Christmas! It will make a great family gift to be enjoyed by young and old alike. I was about twelve and my brother, Kevin was five. We shared a corner bedroom at our home on NW 6th street in Fort Lauderdale. Mom and Dad’s room was adjacent with a thin wall between. It must have been past our bed time, because Dad was watching the late news in their bedroom. However, Kevin and I weren’t quite ready to call it a day and were apparently a bit too noisy. We settled down again, some. But by and by we were at it again, and after the basketball bounced off the middle wall, Kevin dove for the covers. The hall light came on! I slipped into the closet just as Kevin lifted his cover to peer out. He saw me and decided to follow. He whipped his covers back and started out of the bed, but he was too slow. Dad was angry. He didn’t put up with any tom foolery. He grabbed my brother up and gave him a couple of whacks with the belt. Dad was stern, but he never really beat us. Just a few slaps with his leather belt on the legs was enough to get us in line. I think it hurt our pride way more than any physical damage. Kevin jumped back into bed and Dad turned to my bed. He whacked the lumps concealed beneath the bedspread. He tore away the covers, revealing a football, a dump truck and various other toys contrived to resemble a sleeping twelve-year-old… a dummy in the bed! My little brother lacked the experience that I had in dealing with adults. He didn’t know that a laugh on his part was inappropriate at the moment. However, as the covers on my bed absorbed the first assault from the belt, he laughed out loud. “So, you think it’s funny?” Dad whirled around and slapped at Kevin, who had by this time returned to the sanctity of his covers. “Daddy… now wait a minute, Daddy. I want to tell you something!” he blurted out. Dad pulled the covers back. Kevin was halfway between laughter and fear. He pointed at the closet. Well Dad could no longer contain himself, Though he tried. The skin around his eyes began to crinkle and his mouth twitched. By the time he dragged me out of the closet, we were all three laughing at my prank. As it turned out, I never got the spanking like Kevin did. He reminds me of it to this day, more than fifty years later! Get a hardbound copy of What the Kid Did for only $20 (free shipping). 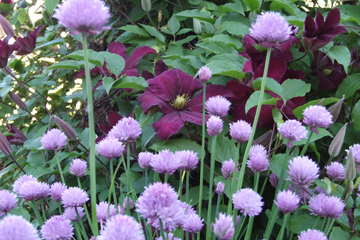 Always full of creative ideas and short of cash, I tend to seek less expensive, but practical ways to do things. So when I took up bookbinding, I outfitted my small bookbinding lab with a mix of tools I found around the house, at garage sales, the hardware and the dollar store. I also designed and built most of my equipment where possible. This punching cradle is made from fiber board. The template is a piece of aluminum angle with evenly spaced holes. It is easy to drool over the shiny brass and exotic hardwood bookbinding tools you find on the internet. There is something about the feel of a quality handmade tool. It’s a feeling of empowerment, of confidence that with this tool you can do first-rate work. You can even make excuses, reasons that you must have a certain tool in order to improve upon your craft. But seasoned crafters know it is not the tool that makes the difference so much as the hand that guides it. A good craftsperson is aware that there are multiple ways to accomplish most any task, from design, to cutting, to fitting and gluing. So it is with bookbinding. One of my best tool innovations is the gravity press. 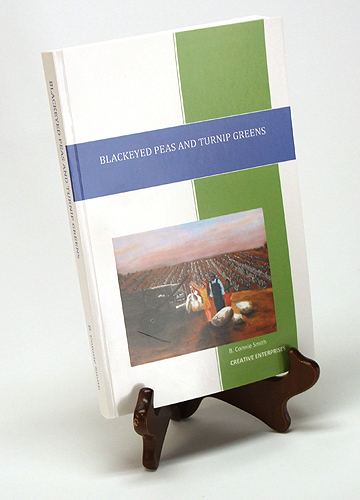 This idea, while not original, has some very big advantages over a traditional book press. The first, of course, is the low-cost. This is because almost anything handy will do for the main functioning element of the press. You can use lead, steel, concrete, sand, beans, sawdust or about anything that can be cut in blocks or contained in a sack. 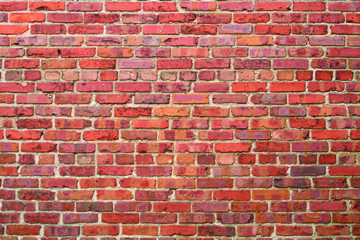 I use bricks (wrapped in paper to avoid unnecessary abrasions and dust). I also use a series of flat, thin fiberboards cut to various sizes to assist in the various clamping operations. They are used to distribute the weights evenly over a given area. By stacking the bricks I can apply a wide range of pressures anywhere I need to. Another advantage is that I can replicate the clamping setup so that I can perform similar operations on a number of projects at the same time. I can easily vary the size, position and pressure as needed. I use some form of gravity press when gluing end papers onto the bookblock. A light weight distributed along the glue line will hold everything together for the short time it takes the glue to set. I sometimes use bricks to hold a number of bookblocks for gluing the headbands to the spines at once. Improvised nipping press using dowels. But the most useful application of a press when crafting a book is to compress the finished piece in order to help to form the hinge joint, and to ensure that the book finishes flat. This is sometimes done with the aid of a nipping press, but can be accomplished with the gravity press just as effectively. Knitting needles or dowels laid lengthwise can be used to take the place of the rigid metal edges on a nipping press. Another good use of the gravity press is to help flatten materials with a curl in them. For porous bookboards, I will sometime mist them with water to relax the fibers and place them under a flat board with bricks distributed evenly. Multiple boards may be stacked with wax paper between them to prevent sticking. Drying overnight in this way usually eliminates any tendency for the boards to curl afterward. I have a small stock of these laminated boards made up that have been allowed to equalize according to the ambient room temperature and humidity. In other words, they lie flat before I will use them to construct covers or boxes. Two thin boards can be laminated with the grain perpendicular to one another and placed in the gravity press to make thicker boards with less tendency to curl. It helps to mist these boards too, before gluing. 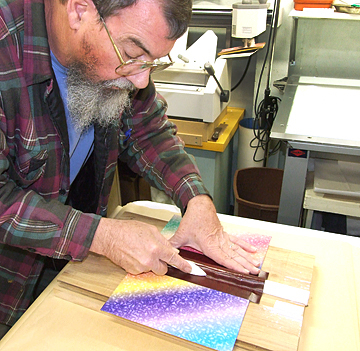 I use two pieces of .065″ Daveyboard to make a strong 1/8″ laminated bookboard. 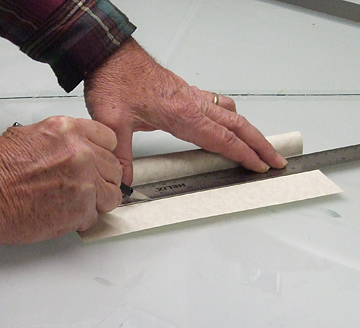 Using a roller, work the glue out to an even coating on the dampened board. Coat both surfaces to be joined. Align the edges, making sure the grain is at cross purposes to each board and press together using your hands. I recommend using a brayer to roll over the joined boards thoroughly to ensure good contact. Place a flat board on top. 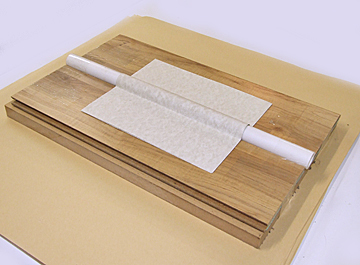 Lay the glued sandwich on a flat surface and place a flat piece of fiber board on top. Distribute weights evenly across the surface and allow the boards to dry for several hours. You may be able to speed this process up, depending on the temperature and humidity of your work area. I like to let mine cure overnight. This method will produce a good, stiff board suitable for larger or more substantial covers. Even so, I often find that in a few hours after removal from the press, boards laminated in this manner will sometimes tend to exhibit an undesirable curl when completely dry. When this happens, I will physically massage (or bend) the board to get it to lie flatter. Distribute weights evenly on top of flat board. By bending the board while it is dry, the tight fibers will stretch. Then I mist the stubborn board again and leave it in the gravity press usually overnight. It is best to prepare your book boards well ahead of time to be sure that they will lie flat when you you need them. 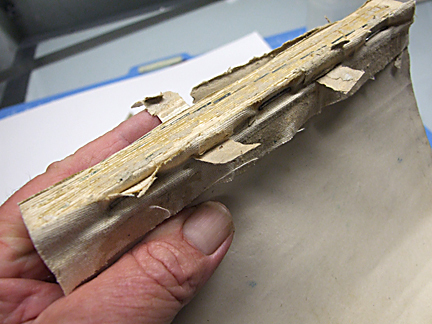 When using water-based glues to adhere bookcloth, the boards will become damp again, but only on one side. This will cause the boards to curl as the glue cures. However, this effect can be offset by misting the other side with water and then placing the cover under the press until the glue cures. Carefully gluing the super with a minimal amount of glue. Sometimes I find the end sheets are too delicate or thin to use PVA glue to adhere the sheet to the inside cover. For these types of papers I find it much more practical to use transfer adhesive instead. The bookblock is mounted onto a nice, dry flat cover with a minimal of glue used to adhere the flap of super to the raw daveyboard. The wax backing is peeled from the adhesive-backed endsheets and carefully pressed into place. The last step is of course, to place the book in the gravity press until it is dry. 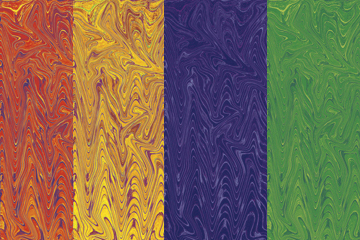 More about making endsheets or endpapers in a future post. Until then, happy holidays! P.S. 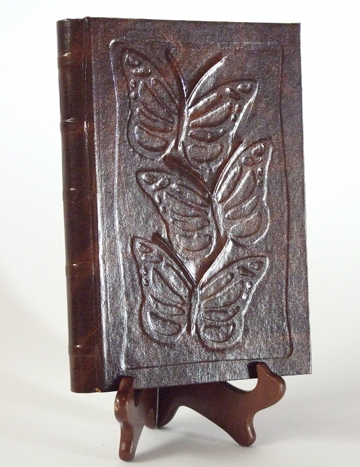 I sure would like to see some comments and suggestions from you bookbinders out there. Maybe you can give me some tips on how to make my bookbinding projects easier and/or better. Lots of old worn out books can be found at garage sales. Garage sales are a great source of antique books. These musty old relics hold a bit of information beyond the printed words and pictures… at least for book binders. 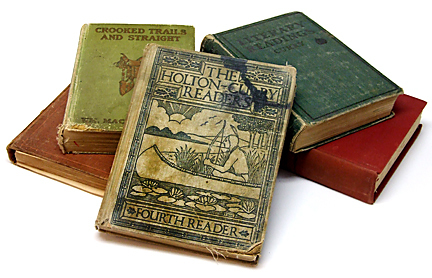 For as little as fifty cents, you can find old books that can be dissected in order to learn how they were constructed. 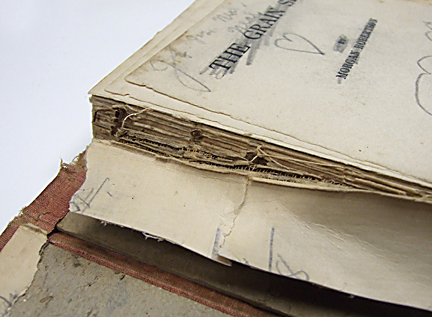 It is not uncommon to find books over a hundred years old, many of which were bound by hand. 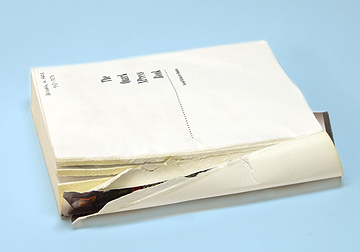 Books may have become damaged over time, their covers torn or missing. Pages are dog-eared and stained. These dinosaurs have outlived their usefulness as texts, but stand in the spotlight for the aspiring book binder. This book has tapes that pass through slots cut into the entire text block, rather than sewn in. 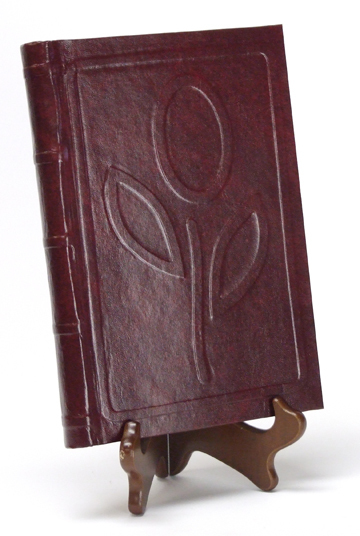 Book covers have been made from all sorts of materials ranging from leather to fine silk book cloth. Most, however were made by wrapping and gluing some sort of fabric around a stiff book board. I have seen book covers made from wood and even woven mats of bamboo. Covers are usually attached by gluing heavy end papers, supplemented by the addition of a cloth backing glued to the spine. 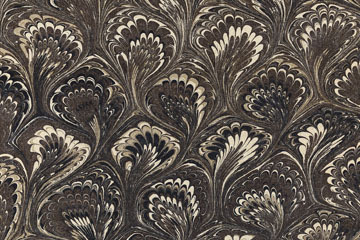 The end sheets are sometimes decorative, and the paper may have been hand made or individually hand colored. 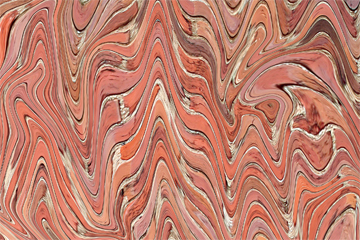 Some striking examples of marbled papers can sometimes be found inside the covers of old books. Removing the covers almost always involves severing the end papers from the text pages. In some cases, the end papers may be moistened and peeled from the book boards to release the cover and reveal the spine. Older book bindings differ in many ways. Each time I cut into one of these old volumes, I may discover another unique method of construction. But there are many common elements too. Folded sheets are inserted within each other to form signatures. These are most commonly in fours to make sixteen pages. But it is possible to find instances where the bookbinder used other combinations anywhere from two to six sheets per signature. Each signature is stitched along the inside of the fold to bind the separate sheets to one another, and then each signature is in turn stacked and stitched along the spine. Here is where I find a variety of stitching patterns. Coptic stitching is a general term applied to sewing all of the pages together into a text block. 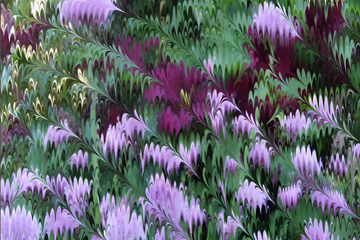 I find quite a few different patterns used, but most employ the use of a kettle stitch to connect the signatures to one another. Coptic stitching using tapes or bands. Once the signatures are sewn in place to make the text block, some sort of flexible material (mull) is glued over the stitches, leaving loose flaps on either side. These flaps are in turn sandwiched between the end sheets and the book boards. The result is a sturdy connection between the cover and the text that will withstand repeated handling throughout the long life of the book. 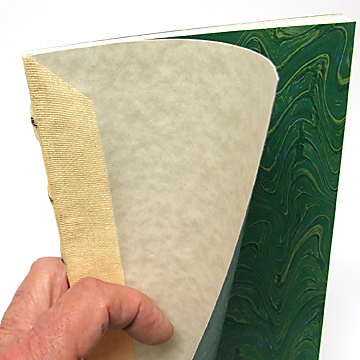 The paper will tear before a page will come loose in this type of binding. Endsheet showing mull backing on text block before assembly with covers. Next time I will show how I construct and assemble hard covers for several types of books. I am always open to new ideas about bookbinding and publishing and would relish some comments and suggestions from my readers. I love to share information and to teach my craft to others. So please, comment, call, come by or send me an email with your thoughts. Nothing like a good old fashioned paperback novel. Stuck on a bookshelf in a closet to be discarded in later years. Most people get their information from the World Wide Web. 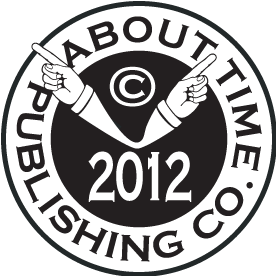 Printed books are losing out to the more timely, convenient and less expensive electronic means of communication. The public is buying Kindles, Nooks and Ipads to aid in consuming current information. But I know paperback novels still have their place. I have yet to have one crash or become useless because I can’t open it. It operates completely independent of the power grid. 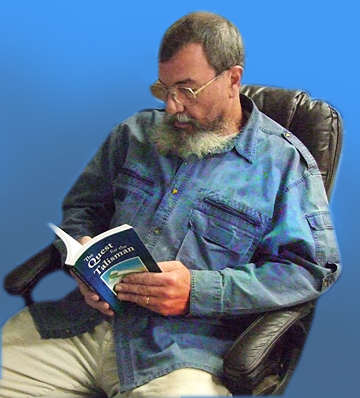 A paperback is not locked down by digital rights management (DRM). I can lend or give it to anyone, confidant that they will be able to access the information (assuming they can read). It will not be subject to hardware or software limitations. Lovers of paperbacks are slow to adopt electronic books. Even those that do will confess there are times when a good old drugstore western, a detective story or even a romance novel in the form of a pocket-sized book with real paper pages is very comforting. No whirling fans. No flashing monitor. No keyboard. Just an independent stack of paper with printed words. Then there are those folks, (my father, for one) who refuse to have anything to do with a computer or smartphone. They can’t be reached unless it is in conventional terms. By that I mean they haven’t advanced beyond television, radio and newspapers. If they read, it is from printed material (only). I wanted to be able to do my own binding so that I could produce a handful of books to give to my friends and family. I was going for the mass paperback look. You know, the squared-off kind with the stiff paper cover that you see on the racks at news stands and at the drugstore. I figured it would be simple and inexpensive. A nicely perfectbound paperback novel will stand up to several readings during which time it will be dog-eared, bent, crushed and spilled upon. It will have spent time on the dashboard of your car, or in your backpack or purse, having its cover folded back so it can be read using one hand while you eat lunch. You will mark places where you left off with anything handy. For all practical purposes, it is a throw-away or disposable commodity. The information contained within is usually read only one time by any single person. Afterward, it is no longer needed and might be passed on to another or thrown away. Producing small quantities of paperbacks has been prohibitively expensive until recent years. Now, with digital technology it is possible to get printing in small quantities at affordable prices. Binding is an extra step, that may not be offered by your digital printing service. So why not do your own binding? It has some real advantages. 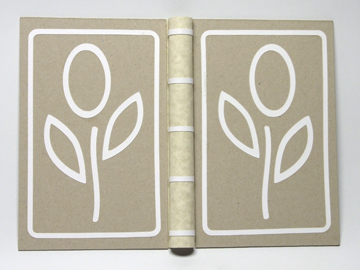 You can use different types of paper for covers and dividers inside the book. You’re not restricted to standard sizes. You can bind as many or as few as you like. 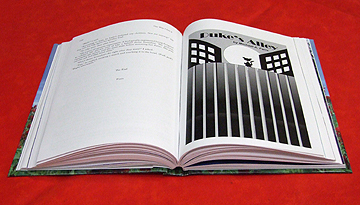 You can bind special personalized pages in each book, in effect varying the content to suit. Having an industrial paper-cutter is a real plus for binding your own books. 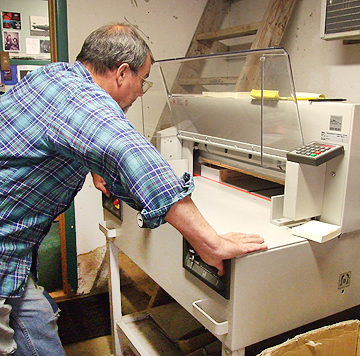 Being a lifelong printer by trade, I have always had access to an industrial paper-cutter. So, to make my own books all I really needed to do was to glue the edges of a stack of paper, wrap a cover around it (also glued) and then trim it out to look like a book. Simple idea? (Yeah, right). During this journey I became more aware of paper characteristics and how much they affect the quality of the book. Smaller pocket-sized books are more sensitive to the paper grain direction and paper stiffness when it comes to mechanics. A stiff paper with the grain running contrary to the spine will make the book difficult to read because the pages will not stay open. Pages will not lie flat when the grain direction is perpendicular to the spine. Another important consideration is the margin between the copy and the spine. This distance needs to be greater than the outside margins in order for all of the copy to be visible, because a portion of the page disappears into the spine. Skinny gutter margins will result in the reader forcing the book open beyond the intended limit in order to view the print. This weakens the spine and it ultimately fails. Too much gutter and the type or image area becomes too small. When the paper grain direction is parallel to the spine, the book will easily lie open without damaging the binding. I have explored different adhesives and applications thereof, all the while looking for a method/material that will provide the most durable and flexible bond for my glued bindings. One characteristic of dime store novels (back when paperbacks really were a dime) is brittle glue. If you can find one at a garage sale or used book store, the adhesive has probably yellowed with age. Opening the book to its limit is likely to break the spine. Pages will fall out easily. More modern acid-free glues are designed to be flexible and to adhere to the paper with more tenacity. A short-run tabletop hot glue perfectbinding machine. People abuse books. Especially paperbacks. The very nature of the animal begs for mistreatment. 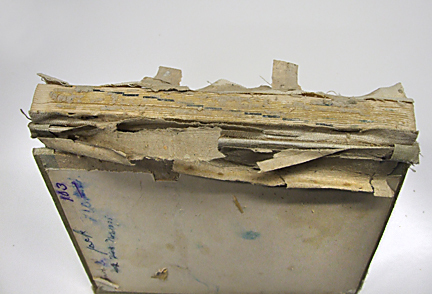 Anything that a book binder can do to improve the longevity of a binding will enhance his product. A typically well used paperback. Broken and torn from age and use. I have learned to score my soft covers close to the spine on the front and back of the book in order to provide stress relief. 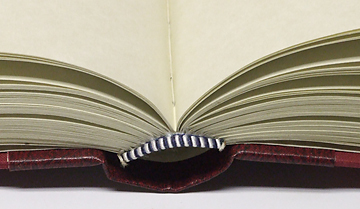 A book made in this way will allow the cover to be opened without stressing the glued spine. Note the strain relief crease in the cover on the left side near the spine. Even so, all these measures cannot ensure that the pages will not ever come loose at some time during the life of the book. But there are ways to make better books that will stand up to the wear and tear that they may receive in use (or abuse). Of course, extra measurements will require an extra investment in time/money. So what’s the value of the content? More sophisticated binding methods should be reserved for more sophisticated or more valuable information. These are the books that you want to keep, open and view often over perhaps years or even decades. These are the poetry books, the art and literature works, the family albums and solid reference volumes. Don’t forget family bibles, music and recipe books, the ones that live out there where you can see and use them. 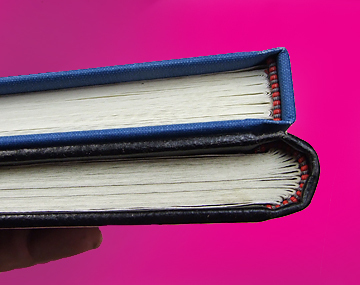 Paperback, or soft cover books can be stitched along the sides to improve durability. This method further encroaches on the gutter margins, but it makes for a rough and tough binding. Not too practical for anything smaller than letter-sized books and still, the book will not lie flat when opened. 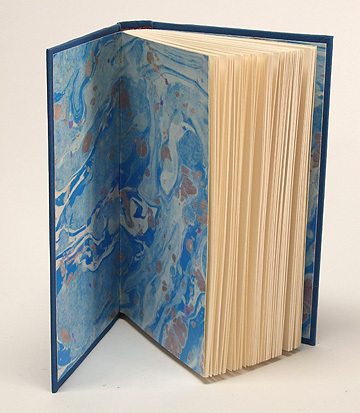 This is a consequence of binding flat sheets of paper to make a book. 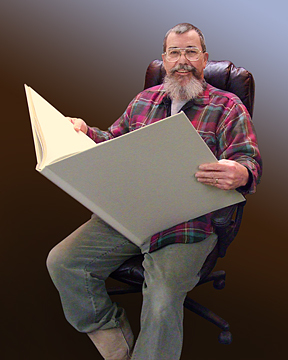 So, what’s a book binder to do? 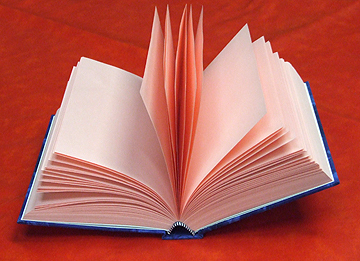 Hardcover books are not difficult to make. Of course, there are several levels of sophistication for these critters too. Simply adding a hard cover to your creation will not necessarily result in a book that will work as desired. 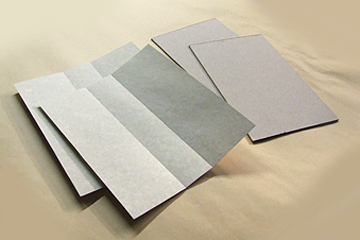 If you are still working with flat sheets of paper, you will always have the flatness issue to deal with. The pages will be subject to the glue and/or stitching integrity. Japanese stab binding is a good way to get into hard covers. There are videos and how to’s readily available to illustrate this type of binding. 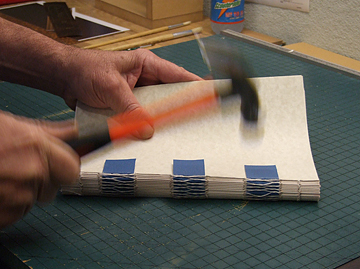 Sooner or later, the DIY bookbinder will want to make nicer, more durable books. But the most effective way to create a quality special book involves stitching folded signatures and then binding them into a hard case. This results in a book that is not only durable, but will function well. A properly constructed book of this type will lie open flat with no damage to the spine. Coptic-stitched signatures bound into a hard case. The book easily lies open with no damage to the spine. This book has pseudo-marbled endsheets printed on a digital press. Learning how to stitch signatures is an acquired skill that is really an art. In fact, there are folks out there that create massive, intricate works of paper in various colors and styles to illustrate their abilities. After stitching countless volumes myself, I am humbled by their work. Here is a good example. This one is really cool. Also check out Sarah Mitchell’s imaginative work, Book Arts, Rhonda Ayliffe, and Garlic Harvest Studio. Next time I will talk about how I build some of my better quality books, including some hard lessons I have learned in the process. Over the years I have experimented with a lot of different ways to bind books. After learning to bind flat sheets with glue using the perfectbinding process, I moved on to more advanced methods involving folding and stitching signatures and attaching them to hard covers. Casebinding is a great way to add beauty and durability to books, and to protect the pages from unnecessary wear in normal handling. These sturdy and handsome books just feel really good to hold and to read. The coptic stitching and casebinding processes are lengthy compared to softcover perfectbinding, but the results are far superior. A properly made book of this type should lay open easily without damage to the spine, and of course, close satisfactorily and remain so. The inner spine should form an arch, bending away from the case, allowing the leaves to lay over to either side. Planning the text layout is the first step in building a book. Beyond all the regular page conventions regarding margins, gutters, type selection and formatting to position the text properly on each page, the layout must be imposed for the press sheet. This process locates each page so that when the press sheet is folded down into signatures, the pages are ordered properly. Four-page signatures are easily accommodated in most word processing programs by use of a booklet utility, which will order and position the pages automatically. Eight or more pages per signature are usually handled by the digital printer with special imposition software.Sixteen-page signatures are the most common, consisting of four sheets of paper inserted within each other. However, any number divisible by four will work. The signatures are stacked and stitched into place next to each other by any of several methods. Coptic stitching binds the pages to each signature and the signatures to each other to create an assembly called the text block. The text block is glued to a flexible mull with wings that will attach to the cover boards. There are basically two kinds of spines: flat and rounded. The rounded spine is more traditional and was developed to reduce the added bulk offered by the cord used to stitch the signatures. The additional spread is fanned out at the spine, resulting in a book that is more uniform in thickness. The flat type, sometimes known as smyth sewn, utilizes finer thread and more stitches to overcome the same problem. 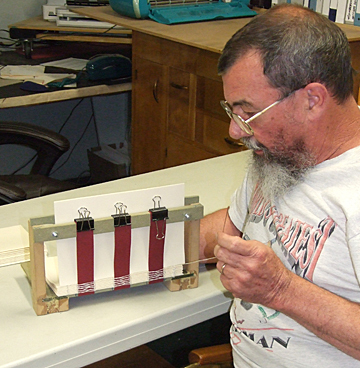 Either method results in a durable binding that will stand up to normal usage for many years. If you decide to bind your own books, a lot of your time will be invested in doing so. If you value your time, it only stands to reason that you should use the very best materials that you can lay your hands on. However, I would suggest that the beginner start with anything they can get for the purpose of learning. Good stitching technique takes practice. I know I made at least ten books from start to finish before I had anything that I was unashamed to show. My first efforts were crooked, too tight on one end or too loose. I missed stitches and tore out holes. I had big nasty knots that bulged at the spine, and my books didn’t open or close properly. But now, with thousands of stitches behind me, I can say they are looking quite respectable. It takes time and patience to get it right. Learn when and where to tug on the thread, and how hard to pull so that it is just snug. Concentrate on consistency so that your stitching looks even and orderly. I spent a lot of evenings in a comfortable chair stitching signatures and listening to a TV or radio program. Home-made stitching loom for Coptic stitching. During this sojourn into stitching signatures, try out different types and weights of thread, different needles and spacing between stitches. Check out the difference between using waxed vs. unwaxed thread. Read up on the various methods of stitching with cords or bands. Try your hand at ethiopian coptic stitches or try to emulate smyth sewing. Any of these methods will produce good books. It is really only a matter of choosing the way you are most comfortable with and then practicing until you get it right. I like waxed thread and stitching with bands made from scrap bookcloth. For my 6×9 journals I use three bands each 1.25″ wide. I punch eight holes into four sheets at a time making sixteen page signatures. I use the kettle stitch on each end and loop through the cross stitch over each band to tie the signatures together. I keep my stitches snug by tugging parallel and tight to the spine at the end of each course. Endsheets go before and after the textblock. 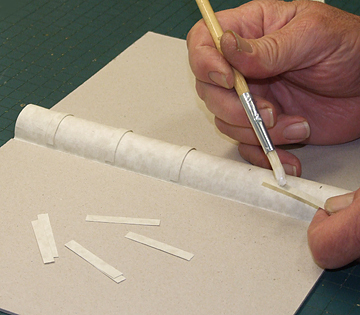 One leaf is glued to the cover board and folds to make the first and last loose pages. They serve as hinges between the cover and the pages. Although many bookbinders will add the endsheets afterward using glue, I prefer to stitch my endsheets to the textblock. When the assembly and stitching of the textblock is complete, I apply a single coat of PVA cement over the threads and between the signatures at the spine, making sure that the block is nice and square and not twisted. Once the PVA has set up a bit (not tacky, but still workable), I round the spine by pinching the textblock and hammering lightly along the seams, driving the outside pages slightly away from the center ones. By gently working the spine alternately from side to side using the hammer and your hands, the spine takes on a rounded appearance, and the leaf side opposite the spine has a marked concave shape to the block. I work the block until it is almost to the desired shape, but yet a little flat, and at this point I choose to trim the three sides on the guillotine cutter. I then finish rounding of the spine, which results in a much shallower concave profile on the leaf side. Alternately, I could round the spine completely before trimming in order to produce a flat result. I made a pseudo headband using a Post-It note wrapped around a piece of twine. The clamp is used to help maintain the spine’s shape as the glue is applied. When the spine is rounded and the block trimmed to my satisfaction, I apply another coat of PVA. To this I add the mull and attach decorative headbands. A final coat of PVA is applied over the entire spine and allowed to dry completely. I should mention here that up until now a lot of effort is made to ensure that the textblock is shaped properly. If it is not cut squarely or is lopsided it will be impossible to correct beyond this point. The cover base is made from davey board and construction paper. I cut my boards the same width as the nominal page width and 3/8″ taller. The spine width is determined by holding the boards in place and wrapping a piece of paper around the spine. Score the paper by running a fingernail along the edge of the boards. Transfer this measurement to two pieces of construction paper and score them similarly. I made a jig for forming a round spine by gluing the two pieces together around a piece of PVC pipe inset between two boards. I assemble the two pieces of scored construction paper with PVA between, working them until they form tightly around the curve of the jig. You will have to experiment a little to find the right size pipe and inset specs to make it work for your book, or if you are a competent scrapbooker and crafter, you can just form the sandwich by hand and eyeball it to get the right shape. Trim the wings from the bottom layer so that only one pair extends to approximately 3/4 to 1 inch to either side. Assemble the boards by gluing to the wings either side of the spine, leaving a small gap equal to the thickness of the bookboard between the spine and the boards. Adjust the curve of the spine if needed to approximate the textblock thickness by placing weights on the boards and allow to dry. A simple but very nice effect can be added at this point by gluing paper cutouts to the davey board prior to covering with bookcloth, producing an embossed look. 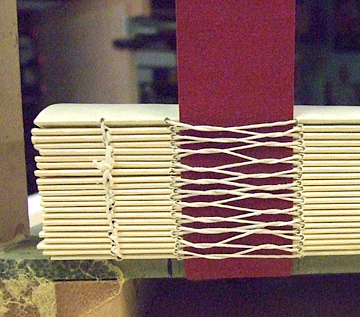 I like to glue bands across the spine to represent the cords used in medieval binding. Any number of shapes can be utilized to create depth. But there are limits. A bit of experimenting will help you to find the right thicknesses and shapes to use to achieve the right effect. To be successful at this bookbinding stuff, one has to dive in there and make a lot of books. Doing so will increase your knowledge of materials and methods. It will also increase your reverence for those that went before us in pioneering the art, develop your style and hone your craft to a more respectable level. Gluing Decorative Spine Bands onto the formed spine. Anybody can cobble a book together. It is the fine points and the details that set the novices apart from the true crafter. Choosing the right covering for your book is part of that experience thing. It took me a while to discover the right properties, mainly because I ignored the bookbinding suppliers at first, being mesmerized by the selection of fabrics at JoAnn’s. I used transfer adhesive to stick the fabric to the boards and they looked great! At first, it seemed the way to go because for one thing, the bb suppliers had a minimum order policy. What was I going to do with ten yards of the same material? I wanted variety, man! Besides, the dealers only had limited choices. The fabric stores had a rainbow of colors and surfaces, and I could purchase small amounts. But as my journey continued, I began to see that my earlier books were starting to sag, looking tired and even wrinkled. I discovered that the adhesive I had used was starting to fail after about four years. This was not good. I had settled on transfer adhesive because it was not as messy as glue. 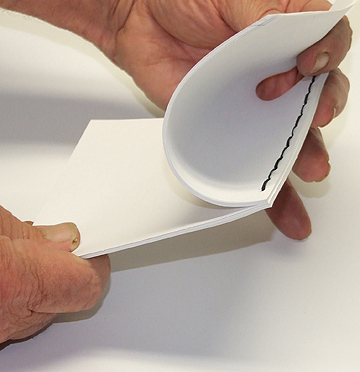 Production orders could be processed in less time with no risk of damaging the books with glue on unwanted surfaces. It seemed a no-brainer. But now I think that was a mistake. Bookcloth is designed for the purpose of covering books. It is stiffer than regular cloth and it has a coating on the back side that prevents the application of liquid glue from bleeding through to the front side. In comparing costs, I found that the cost of the transfer adhesive plus the fabric exceeded the cost of real bookcloth and liquid adhesive! (Dang! Those bookbinder guys really have it together!). But now I had to learn to use the liquid glue, despite the obvious drawbacks. So I opened my mind and researched the process. To my surprise, I found it to be not so difficult and very beneficial. In fact, I kicked myself for taking four years to discover it. (Dang again!). The two main things that sold me on PVA were the much lower cost and its versatility. Once I learned to work with it I decided it was the only way to go. 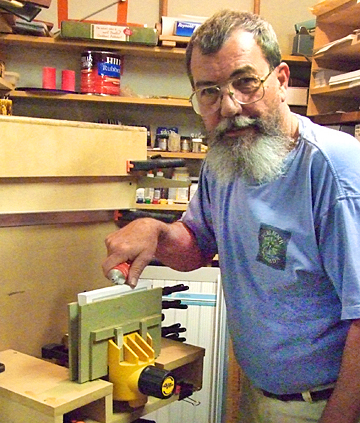 Here is a good tutorial on gluing by a master craftsman. 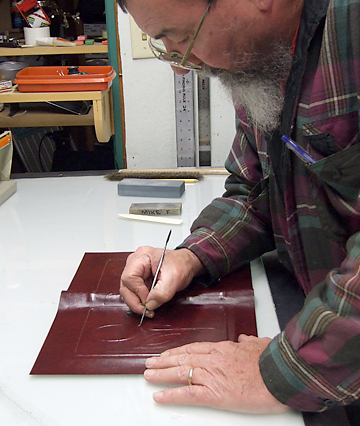 In fact, I recommend watching all of his videos for dozens of good tips on bookbinding. Remember, it’s the details and fine points that set you apart from the others. I like to have a one inch wrap margin for my covers. I start by coating the bookboards and spine with PVA using a roller. I then center the bookcloth and proceed to rub it down starting from the spine and working outward, being careful to push the cloth down into the crevices with my fingers as I go. Once I have it fairly smooth and even, I trim the corners at 45 degrees and wrap the long sides first, taking care to burnish the surface well, and wiping off excess glue with a damp cloth. Then I crimp the corners and turn the short sides in. To finish, I continue to rub and burnish the bookcloth, using a stylus and bone folder to work the surface to form around the cutouts, to produce the embossed effect. The finished cover should be placed under weights to ensure that the bookboards dry flat, due to the wet adhesive applied to only one side. Otherwise they will curl as the glue cures. Be sure that all the glue has set and the cover is dry and the boards are flat before proceeding to the final assembly. Next time I will be covering the process of making and attaching end sheets as well as final assembly into a finished book. I welcome comments and any suggestions you might have for future articles. I love to talk and write about bookbinding and publishing, so hit me with some feedback! Real do-it-yourselfers have a craving for knowledge about how things work. We aren’t satisfied accepting things “off the shelf”. We have to take them apart to see what makes them tick, and in many cases we wind up modifying or even building a better version using the knowledge gained. Once the basic principles have been learned, the true DIYer will look for ways to make it faster, cheaper, more appealing or whatever. The satisfaction gained from these journeys nourishes the creative fires and feeds the soul of these DIY creatures. 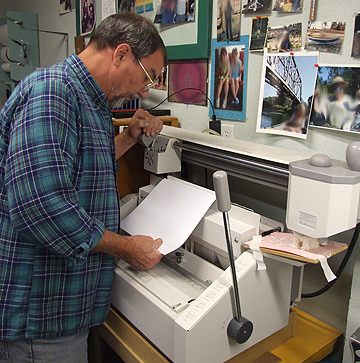 A printer for more than forty years and a writer for the past twenty-five, I have always looked for ways to print and bind some of my work… in small quantities. The digital press opened the door, at least to the printing part. Finally –an affordable way to print books. I could even print a single book if I wanted. Digital printing is the writer’s dream come true. The work comes off the press already collated and in order, just like a real book! Zowie! The only thing missing to make it actually be a book is the binding part, something I felt could do for myself. After all, what could be so difficult about gluing a stack of paper, right? My first perfectbinding effort using Goop silicone adhesive. So I tried it, using some scrap paper and some silicone rubber. I placed the stack between two boards, put the sandwich in a vise and smeared some Goop on the bind edge and it worked! I was able to wrap a pretty respectable cover around it in a separate operation. I was elated! My home-grown process worked so well that I bound my first run of my first novel that way. The process took me the most part of a day to bind five books, but they came out perfect! I had perfected perfectbinding in my garage! Later, I learned to score the edges and scrub the glue down into the book block to penetrate and form a better bond. Later still, I bought a table top hot-glue binder that bound the cover to the edges in a single operation. However, I have to say that the hot glue holds no better than the silicone rubber did. So now I could make my own paperbacks. Big deal! Once I got over how cool it was, I decided to try a hard cover version as it seemed to be just an extension of skills I already had developed with my paperbacks. I was sure I could do it. And so began an adventure! My first few efforts were laughable. They were uneven. Some of them wouldn’t stay closed, and most of them wouldn’t lie open without suffering damage to the binding. But I didn’t lose heart. 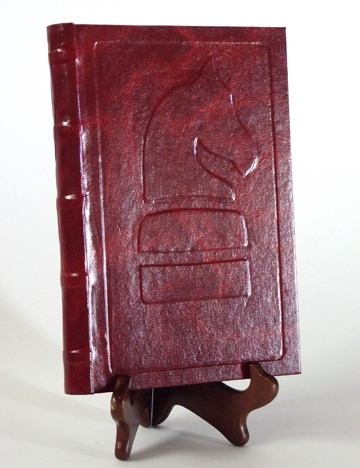 I was determined to find a way to use modern materials and adhesives to produce a nice looking and durable book. I tried this and that idea, trying to emulate the common hardcover book with the tools and knowledge I had at my disposal. You see I was tired of the look of production books, the mass-produced paperbacks and bookstore hardbacks. But by trying to ignore the old ways, I missed all the important things that traditional bookbinding could teach me! Duh! So I started taking old books apart to see how they were constructed. I bought a few manuals on book binding and book repair and I read all the articles and watched all the video tutorials on traditional bookbinding. Then I began to see the process in a different light. 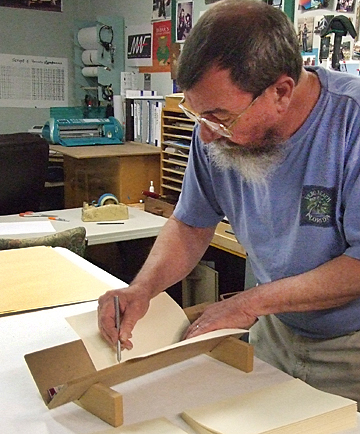 There are two major categories or methods to bind pages: flat sheets or folded signatures. 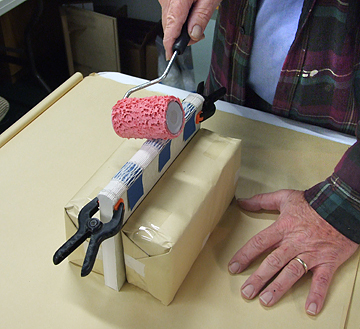 Perfectbinding flat sheets by the application of various adhesives is the most common (and cheapest) way to bind books. This binding method lends itself very well to digital printing, as there is virtually no complicated bindery tasks like folding and stitching required. Hot glue does a respectable job on uncoated paper. 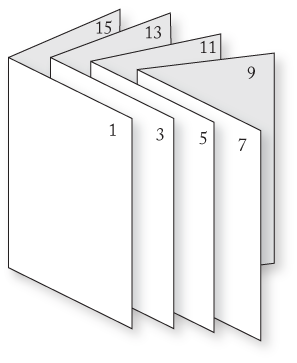 Additionally, holes can be punched or drilled near the bind edge for the purpose of stitching coated or glossy papers. The result of gluing and stitching is a very sturdy binding. However, stitching from the side robs a lot of margin from the gutter or bind side. Allowances in the book layout must be made for this. Also, the paper grain should run parallel to the spine to favor the book construction. Folded signatures are stitched in any number of ways before attaching the pages to a flexible cloth backing. 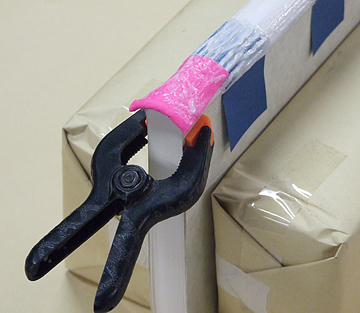 This is a much more durable way to bind books, but it is more time-consuming and uses more materials, because this method generally involves a hard cover or casebinding. But the most important lessons were in the hands-on experience I got while attempting to follow the traditional methods to bind my work. I was surprised at how much easier it was to use tried and true materials… especially adhesives. Beforehand I was convinced that modern non-water based materials were stronger and easier to use. I thought it would be more efficient to use transfer adhesives and hot glue to produce my books. But I was dumbfounded to learn how wrong I was! Those materials are more expensive and far less forgiving than using water-based liquid glues. Home made stitching loom for Coptic stitching. With practice, I learned how to judge how thick and wet the glue should be, how to apply it and how long I can work it before it sets up. I learned which surface to apply it to and how to rub out all the bubbles and burnish paper to board. I have to say I am sold on PVA, a relatively modern water based glue that lends itself to traditional (and modern) bookbinding methods. One thing I was able to do was to make many of my own tools and equipment, a truly satisfying thing that fed my inner desires to create. The more conscious I became of exactly what I was trying to create, the more comfortable and capable I felt about making it happen. I began to look at the world differently. I saw bookbinding tools in everyday items — spatulas, putty knives, tweezers, carving knives, knitting needles. I saw bookcloth in fabric prints, batiks, old blue jeans, vinyls for sign making , placemats, old maps. I have now lost count of how many books I have bound for myself and others. But I feel like my work has improved considerably over the years. Though I built myself a couple of book looms to aid in stitching signatures, I am just as comfortable stitching a book in my lap… and stitching is a trip! So many ways to do it! I experimented with several stitching patterns until I found a couple that suit my style and I have worked to refine my stitches so they are now looking uniform and just tight enough to hold things together. I will often experiment with new ideas using scrap or discarded materials. Once I get the method down, I progress to quality materials. In servicing my customers, my philosophy is to use the best I can afford, as cheap materials are not worthy of my time. 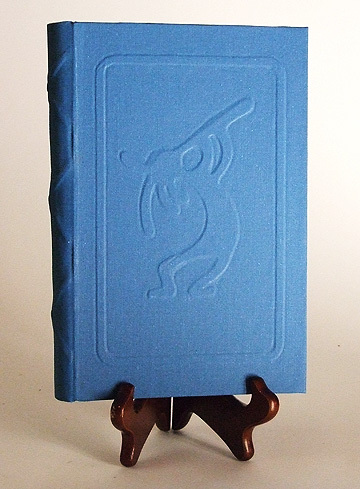 I will be posting some more information on how writers can bind their own books in a variety of unique and interesting ways, including some of my experiments in hot foil tooling and blind embossing. 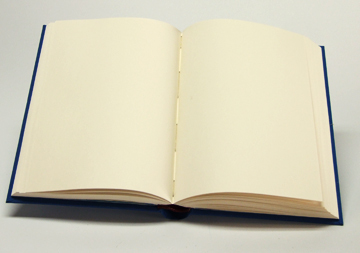 Another journal - 320 pages. These covers are bonded leather bookcloth. I started checking out audio books to listen to on my mp3 player. I downloaded some free classics that I found on Librivox. These are mostly public domain books read and recorded by volunteers. Having read some of these books in the past, I had an idea of what to expect… but I was mostly disappointed. Don’t get me wrong. I fully support their noble cause and salute their efforts to preserve literary heritage. But there has to be better quality material available in the way of audio books. For me, lengthy novels like Jules Verne’s 20,000 Leagues Under the Sea quickly became boring and difficult to follow. The same of shorter ones like Sir Arthur Conan Doyle’s The Adventures of Sherlock Holmes. Why was I dissatisfied? Aside from sound quality, which was rather poor to good in my opinion, there was something about the intonation or pace that I didn’t like. But hey! What can you expect for free. ..and what can a really good audio book sound like? So I went to audible.com. Here I found much newer, popular books read by professional people. Yet I chose to purchase another classic: Jack London’s The Sea Wolf, narrated by Frank Muller. The book was over nine hours long. Sound quality was way better, and the narration was excellent. After that I purchased Henre Charriere’s Papillon, narrated by Michael Prichard. I had seen the movie starring Steve McQueen and Dustin Hoffman, and loved the story, but the eleven-hour audio book was even better! So what made those books better? OK, the sound was produced by professionals, people who specialize in recording quality… and it’s what you would expect. The track was all normalized, optimized, tweaked filtered and whatnot to create the best possible results using current mainstream technology. But more than that it was the narrator’s tone, inflections and perhaps the soul that he put into the reading. True, a great storyteller needs a good story to do his thing, but the life he breathes into characters becomes the spice to the essence of the tale. His voice paints a vivid picture made more complete by his intonation. He adds character to characters. They take on more meaning just from the way he expresses the words used in dialogue and descriptive writing. Of course, the professional audio books cost money to produce and to own. They are often subject to digital rights restrictions, which severely limits the ability to transfer them from one device to another. 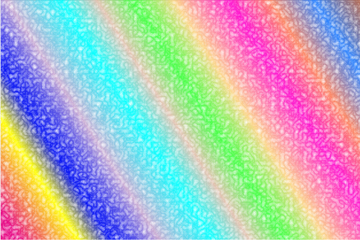 This is intended to prevent unauthorized downloads and free use of the material. But is it really necessary for the newbie author? So the big guys have produced professional quality audio books by famous and popular authors selling anywhere upwards from ten to thirty dollars or more that are difficult to give away or share due to DRM. (Personally I would love for someone to steal my material and pass it all around… Heck, make it go viral! It’s free promotion for me. I can see nothing but benefit by not using DRM. But that’s a whole different subject). This model works for an established author with a track record. He gets great reviews and wide distribution as well as premium space in the brick and mortar bookstores. The business plan is structured so that everyone along the path of production, sales and distribution gets their cut of the proceeds from the project. Nothing really wrong with that model, except that it requires prior establishment of and considerable investment by the author. But what about the fledgling author just starting to flex his wings? The one without the budget. And what does it mean to the writer with several published books under his belt that wants to expand into audio versions of their work? Does it really take big bucks to produce and market your own audio books? Can a person produce a good audio recording on their own? I’m thinking that along with the flood of new technology comes a vast opportunity for creative writers. Obtaining the software and learning to record your own narrations is simple. All you need is a modest investment in a good microphone, and a computer with a sound card plus speakers. The rest depends on your ability to tell a good story. Notice I said tell. You might believe you can write a good story, but can you tell one? Have you listened to your recorded voice? What do others say? How well does your work come across when it is narrated, rather than absorbed by looking at the printed page? Words can only half describe the author’s real meaning. 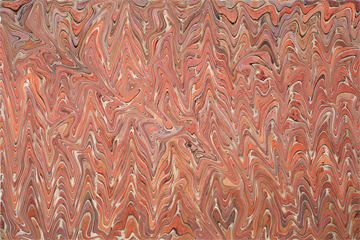 The other half comes from the subtle inflections and emphasis of the voice. An author may even feel that no one can read it like they wrote it, except maybe themselves. Punctuation and diacritics can only go so far in describing speech. The very same printed words when spoken by different people can sound so different. So if you can write a good story, and you can tell a good story, what’s to prevent you from making your own audio book? In an effort to find out, I obtained a dynamic microphone and downloaded Audacity, a free program for recording and editing sound tracks. I made some tests in my relatively quiet office, laying down tracks of my voice while reading some of my material. After comparing samples made with and without the pop-filter, and testing different mike positions and volumes, I attempted to do an entire short story. Right off the bat, I stumbled and stuttered, causing me to pause and reread portions many times. But I would stop and patiently repeat the words until they came out the way I intended for them to sound. The whole process took about an hour to lay down the raw track. However, the editing process takes a lot longer, especially if you factor in the learning curve. For me, it took approximately six hours of recording and editing to produce what I felt was an acceptable file. 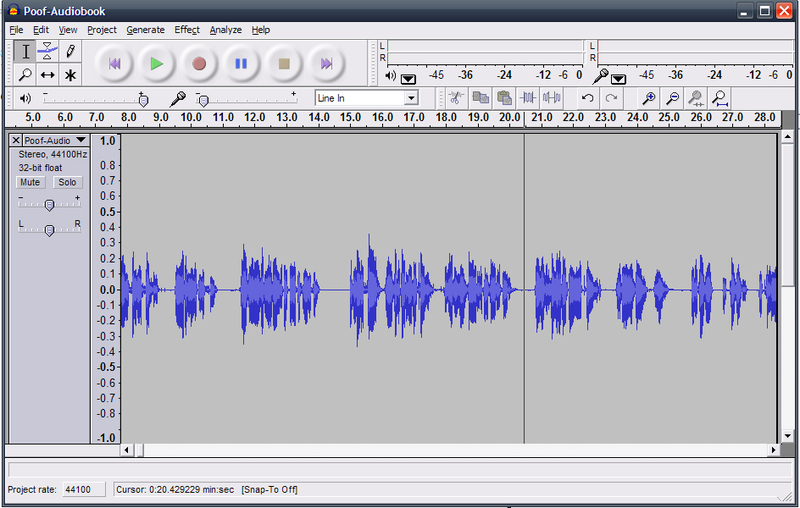 Audacity is a cool program that anyone can use. It records in .wav format, which is an uncompressed file that will play on any Windows Media Player. When you open the file it is graphically represented on a timeline from left to right. 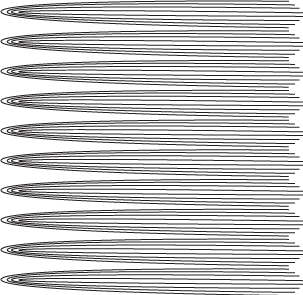 Sounds are represented as groups of squiggles that form definite shapes. Besides the ability to cut and paste, there are dozens of effects that can be applied to any selection. You can amplify or soften the volume, fade sections in or out, change pitch, eliminate pops and unwanted sounds, adjust the high, mid-range and low tones and take advantage of many other professional features to edit the sound. I archived my edited track as a wav. file and saved often as I progressed. When finished, I was able to import the file to mp3 and transfer it to my portable player. I casually plugged the player into the deck and turned the unit on. I kept glancing over at her as the piece began, watching her reaction. We both burst out laughing. It sounded pretty good. Not bad for a novice. So my next questions are: Why do you need to hire out this service? What is it about the process that you cannot do yourself? It would seem that pushing your art to the next level would be an inviting challenge, worthy of your creative abilities as a spinner of great yarns. 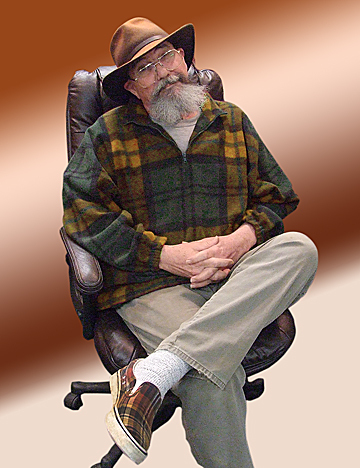 So for an online test, I have recorded one of my poems – Completely Stumped by Michael A. Faris. How does it sound to you? I’d like to hear from some other folks that have tried this. Let me know your experiences and conclusions. I especially want to know how indie authors view DRM. Good dogs and all kinds of cats. Merle said it with the song “My Own Kind of Hat”. It speaks loudly of the desire for indie authors to create their own brand, regardless of how the literary world has elected to categorize them. Writers want to stand out from the rest, to be seen as unique artists in their own right, presenting work in their own style. 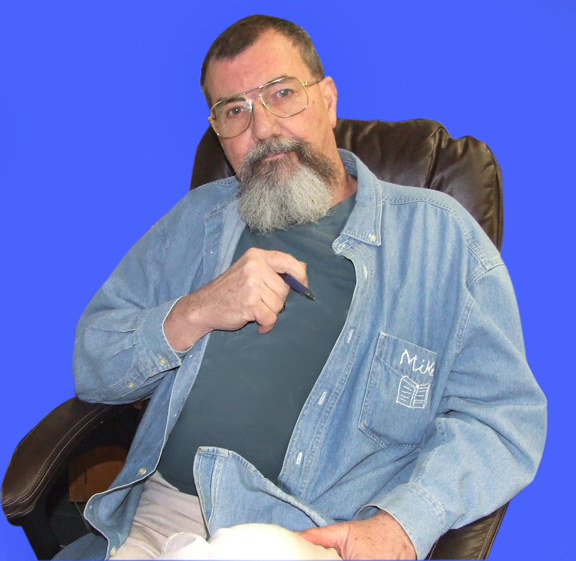 Few authors today will place themselves firmly into any one genre. Doing so tends to associate their work with other “genre branded” authors. It means their work is stereotyped. Tagged. Pigeonholed. We conjure all kinds of preconceptions when we have a label applied to anything. Our experience with classifying things teaches us to expect certain behavior when we encounter similarly labeled products. Associating a label with specific traits subconsciously embeds this information in our minds. 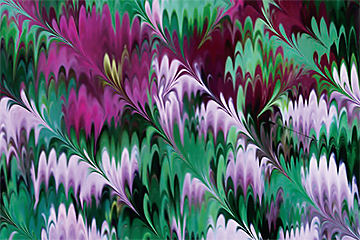 This conception is tempered by an individual’s unique experiences associated with the label. This alone is enough to give everyone a totally different slant on any given category. Some things are indelibly woven into our concepts. For instance, if you see two men with guns facing each other in the street. One is wearing a white hat, the other a black one. What things come to mind? Most of us think of a good guy about to duel with a bad guy. Why? Because it was hammered into us from the time we watched that first episode of Gunsmoke. Good or bad, you can tell by the color of the hat. Attempts to define specific genres suffer the same drawbacks as any classification system. They specifically include some things while excluding others, and so it becomes necessary to understand the limits of the system you are using in order to appreciate how to best utilize it. An author might try to qualify their work by adding a note that further defines it, but the truth is that genre classifications tend to blend into each other at the edges, making it difficult to pin some types of work down. In any case, aligning oneself with a generic or general classification could result in an unfavorable brand that limits the scope of your work. Plato started this genre stuff, and Aristotle elaborated on it. Down through the ages, others have massaged the concept and expounded and debated the subject until it has mushroomed into a complex set of loosely defined definitions that cannot be agreed upon by anyone… completely, that is. Some authors have been driven to try spanning two or more genres in an effort to categorize their work, but this angle might serve to cloud their image even more. Just as there are the crossover musicians which appeal to a broader cross-section of fans with individual tastes, so there must be authors with the same kind of charisma, ready and willing to cross the lines and make their work available to a wider and more varied audience. Branding yourself as a “one-size-fits-all” kind of writer might tend to dilute your image. I don’t believe there are any genre police going after authors inventing their own classifications, but I expect there are penalties. But if you are truly an indie, you won’t be encumbered by traditional rules. You will bravely stick to your course and hope that your social media effort will gain enough followers to see you through. You will realize that there is a much bigger audience out there if you don’t confine yourself to any one genre. But one thing is certain. It is difficult for readers to make any kind of judgement about your work unless they can either compare it to something familiar or experience it firsthand. Try to connect with and appeal to folks that have similar likes and preferences. .. those with their own kind of hat. Do you have some thoughts about assigning a specific genre to your work? I’d like to hear how some other indie writers out there seeing this problem and what they are doing to avoid it… or maybe they totally disagree. What do you think? Let’s hear your side. Labels… so many labels that attempt to define who we are and what we do! Arbitrary categories mean different things to different people and require even more sub-definitions to clarify our concepts. For instance, if I told you I was a fiction writer, what would you think? I have just placed myself in a general category that basically says I make up my stories, but it doesn’t convey any sense of the types of stories I write nor does it indicate anything about my style. 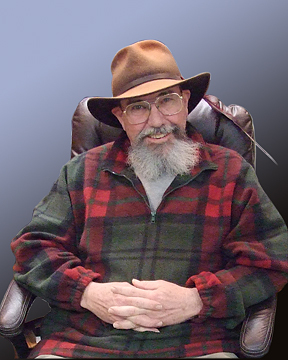 As far as you know, my work could be anything from crime mysteries to fairy tales, mythology to science fiction. So now I say my work is fantasy-adventure, which narrows it somewhat, but it still encompasses a wide range of possibilities… still pretty near infinite, I’d say. I could suggest that my work touches on science fiction and involves crime mysteries. But that tends to widen the field again. 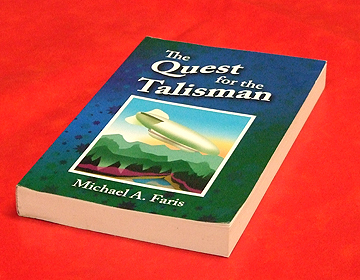 How about if I say my genre is sci-fi-fantasy-mystery novels with a touch of humor? Sitting astraddle of a handful of these categories somehow makes me uncomfortable and really clouds the issue. Perhaps I would feel better just going back to the general fiction classification, but it wouldn’t serve well. So how should I go about defining the type of writing I do? I could say I was inspired by such writers as H.G. Wells, Jules Verne, E.R. Burroughs, J.R.R. Tolkien, John Steinbeck, Mark Twain, O. Henry and others. But does that do anything to clarify it? Not really. Maybe I could find another writer that produced work similar to mine and compare myself to them. But that would tend to dilute my image as a writer with a unique style. Hey! I blaze my own trails! I’m not a copycat and I refuse to try to model myself after anyone else’s style. Like most writers, I feel my work is unique. It doesn’t really fit wholly into any one category or classification, and I’ll be damned if I will try to make it do so. So maybe I should invent a new genre? How about MysSciFiHumFant? Say it real fast and it sounds… well, silly. But am I all alone? How many writers have difficulty classifying their work? What if you write several specific kinds of fiction? 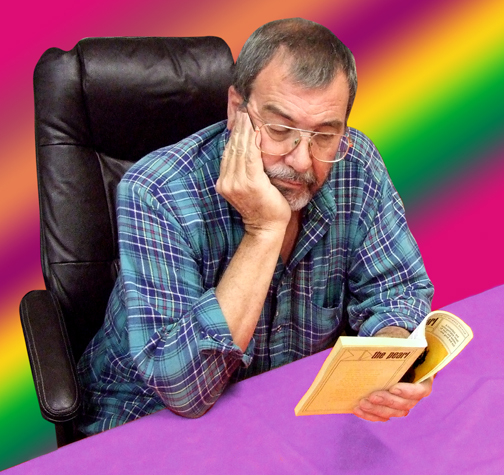 I not only write novels, but I have tried my hand at poetry, songs and short stories, all with different styles and I’m not sure you could classify any of them. I prefer to think of my genre as undefined and without limits. I’m a free-thinker and I want my writing to reflect that. So it seems that the best strategy might be to give ’em a little taste without telling them what it is. My mother (and my wife) have both tried this technique in order to get me to broaden my horizons and try new things. I must say it has worked on some occasions and I have indeed expanded my experiences for the better. I’m suggesting here that whether you are Scorpio, Pisces or Sagittarius, you could actually step outside your assigned preferences and check out some of the unclassified literature being produced by some very talented writers. Genres be damned! I hope to be interviewing some rogue authors in the near future to find out how they see themselves and what they are doing to promote their work. As always, I invite comments and suggestions about the business of indie publishing and ways to help fledgling authors be seen and heard. What’s your genre? 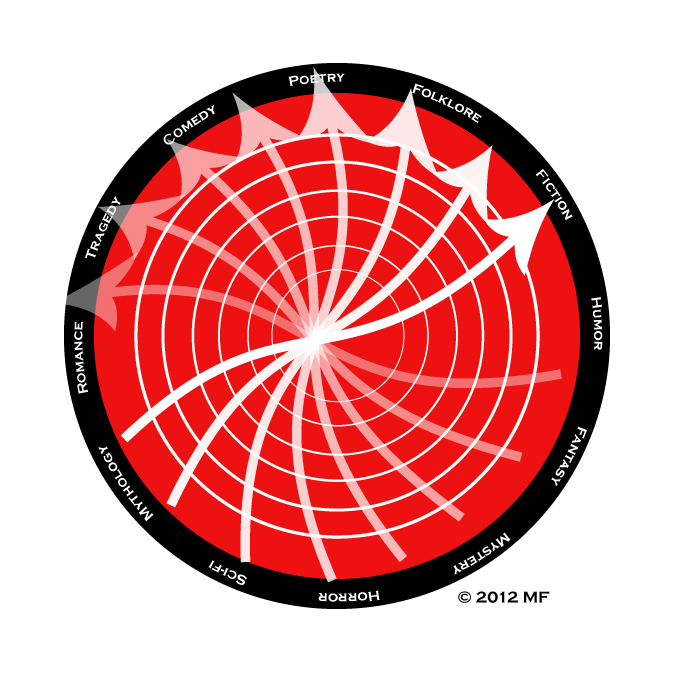 How do you classify your work ? I have three books available at present. Check out the links at the very top of this page.